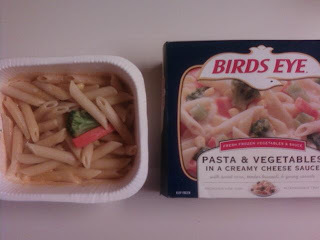 So I'm about to eat a microwave side dish of "Pasta & Vegetables" from the good folks at Birds Eye last night. After removing the plastic film from the tray once it stopped nuking, I noticed a lot of pasta paired with a sole carrot and singular broccoli stem (pictured). I'm not really complaining because I selected the dish more for the pasta than the vegetables. I know my resourcefull wife will be sending a complaint to Birds Eye though to get us something free. Note: After stiring the food post-picture, I did find 3 more small carrots and some corn burried beneath. Hahaha. That's a good blog entry.